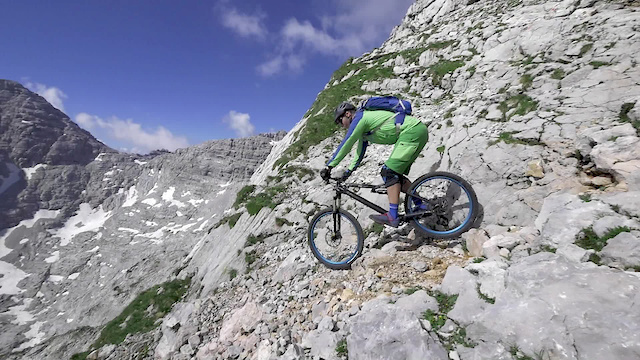 Johannes Pistrol riding a steep exposed mountain in the Lofer area close to Salzburg, Austria. Inspiring stuff! But did anyone notice some object flying insanely fast through the frame at 3:26? What the hell was that?! A bat. Out of hell. Can't be wingsuit because it's going uphill over the top of the mountain...and definitely it's not drone, not that fast unless they made some after video manipulations in attempt to remove it from the footage. Just a bug flying past the camera. Those aerial shots are unreal! Awsome music and views! VOD! Super fun and very cool but the aerial shot was way too long! But these trails always look so awesome, great work! Yes it was a very cool! Perspective! And very cool video overall!! Mountain bike trials is a small but awesome category of biking. Definitely my favorite type of riding; it deserves its own title as a real discipline. That cliff-side trail was probably like a quadruple black diamond! This is some riding. Awsome man. Watching this video caused me serious stress!